landscaping benefits Woody's Custom Landcaping, Inc.
What are the landscaping benefits when installing landscape projects at your home. Besides getting a great outdoor living area, there are quite a few other reasons to landscape. Grass and Trees Provide Cooler Temperatures. Landscapes are Good for the Air and Water. Xeriscaping Reduces the Use of Natural Resources. Outdoor Living Areas Improve Quality of Life. Landscapes Offer Economic Benefits. Such as raising the home value up. 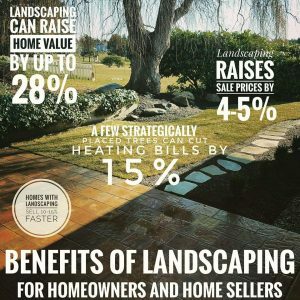 By spending 5% of the value of your home on the installation of a quality low maintenance landscape, you could boost the resale value by 15%, earning back 150% or more of your landscape investment. Source: Taylor, C. 2003. “Fertile Ground”. Smart Money, March 2003. Water Features Make Landscaping One-of-a-Kind. Take a stroll down to the lower Belgard paver patio, and sit around the propane fired fire pit. The biggest reason to landscape your home is for your own personal enjoyment and pleasure. Landscaping your home does make a difference to you and to our society. 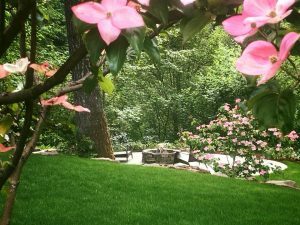 Here are some more landscaping benefits from a landscaping blog post I wrote a few years ago. Trees can cool a city by up to 10% by shading our homes and streets which reduces air conditioning by 50% in the summer. The cooling effect of an average sized lawn is equal to about 12 tons of air conditioning, which is greater than a typical home’s central air condition unit. The greater the amount of trees creates a more natural habitat for wildlife. One acre of turf can absorb hundreds of pounds of fossil fuel-created sulfur dioxide per year. A well designed landscape that includes well places trees can save 25% of a household’s energy consumption for heating and cooling. Three properly placed trees can save an average household anywhere from $100 to $250 in annual energy cost. 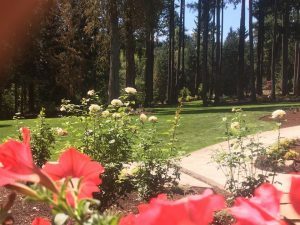 A view through the roses in this large Ridgefield WA landscaping project.